Large upper-middle class coupés only made commercial sense if they could be produced to appeal to both domestic and US audiences. Mercedes-Benz, BMW and the Japanese manufacturers alone seemed to understand this, ensuring they could export their offerings to the sector’s natural habitat. Success in automotive terms had traditionally been predicated on success in America and for that, a luxury coupé was highly desirable. For those who could derive a comely shape from more prosaic underpinnings and sell it successfully in the U.S, riches awaited. Those who by choice (or circumstance) remained Euro-centric found the situation considerably less clear-cut. Large coupés tended to be produced for Europe during times of plenty, when manufacturers felt expansive and customers had money to spend on such trinkets. But when economies take dives, these cars fall out of favour and automotive sackcloth is donned – at least until the cordite clears. For example, the Lancia Gamma coupé was conceived prior to the 1973 oil crisis but by the time it was launched, the European market for such cars had all but dried up. Now it’s fair to say the Gamma’s problems ran deeper than this, but when it was discontinued in 1984, Italy’s sole offering in the segment went with it. France also abandoned the luxury coupé by then; the elegant Peugeot 504 coupé discontinued two years earlier. Opel took longer to admit defeat, ceasing production of its Senator-based Monza in 1986, leaving the market to Mercedes and BMW. It was left to Volvo to fly the upper-middle class coupé banner. Volvo had Mercedes squarely in its sights when they launched the 780 ES in 1985. Visually, a bit of a throwback with its distinctly angular silhouette, Bertone however did an excellent job of creating a dignified, elegant, proportional shape. To little avail since Volvo could hardly be said to have made waves or indeed much profit on a model which sold a mere 8000 units in five years. Clearly, it was also Mercedes and BMW that ARG were after when the 800 coupé was first schemed in the early ’80s. Mid-size coupés had proven to be a lucrative profit centre for the Stuttgart firm and like Volvo, ARG believed it would be possible to grab a bit of that action if Rover could be placed further upmarket. In 1985, they displayed the handsome (if hardly production-feasible) CCV concept as a precursor to the 800 saloon. A production version was to follow, but by the time the funds had been cobbled together, its push across the Atlantic had foundered – the Sterling débâcle having already reached its messy climax. The 800 Coupé struggled along for four years. It’s inconceivable that they sold more than a few thousand. ARG’s onetime partner, Honda, had by contrast made serious inroads with the jointly-designed Legend, which in its first two series, was also made as a coupé. The second series Legend Coupé was a fine looking car, (and a successful one in the US at least), but Honda’s lack of prestige hamstrung the model elsewhere and by the time the third series was launched in 1996, a coupé derivation was notably absent. Future Honda coupés were based on the more compact Accord platform, Honda surmising that if they couldn’t sell a large coupé with an upmarket Acura badge, it was probably best to call the whole thing off. Perversely, when the Lancia Kappa Coupé was launched in 1997, most of its rivals had already packed up and left the field. For Fiat, the Kappa was their first attempt at such a vehicle since the Gamma, which as everybody knows was a marketing disaster, but its Pininfarina styling was almost universally fêted. Sadly for Lancia, Fiat centro stile was unable to come up with anything as alluring – damnably, its Berlina counterpart presented a better looking, more harmonious visage. It doesn’t take an Einstein to work out that the Kappa turned out to be a bit of a commercial damp squib. Since the coupé was virtually hand-built by Maggiorra, the final production tally of slightly over 3000 could hardly come as a shock. There was to be no further Lancia coupés. However, the wonders of photo-shop suggests what could, in an alternate universe have followed. I don’t consider myself much of a fan of Lancia’s Thesis, but whatever other qualities it may lack, gravitas is not one of them. As a putative rival for a large Mercedes coupé, this digital render has something going for it. Today, only Mercedes offer four-seater saloon-biased two-door coupés. To find anything else of this ilk, you need to go looking amongst the exotica. But then, the very notion of what constitutes a coupé now seems to be open to interpretation. We have four-door coupés, SUV coupés, a failed attempt at a coupé MPV and more recently, a five door hatchback masquerading as a coupé. So the waters are considerably muddier now. One thing is clear though – the mainstream upper-middle class coupé is as good as dead – largely because the automotive upper-middle class itself is facing extinction. The large coupe is alive and well but is a concept owned now by the “prestige” makers. Audi, BMW and Mercedes produce a range of such vehicles at price points well within the range of the mass manufacturers. It is an interesting paradox that the flexibiliity of current design processes and the scaling advantages of multi-vehicle line platform technology do not allow Ford, Opel or Volvo to produce two door variants of their lines as they did when the 780, Granada coupe or Monza were available. I find the idea of Mondeo or Focus coupe rather appealing in the way an Audi A5 coupe less so. Perhaps I am among the few who retain a soft spot for the cheerful ease of a Granada coupe (with wooden door cappings!) or the under-rated charm of the Monza. The failure is not really one of technology but marketing skill. Is the A5 really any better than a Ford Mondeo or Opel Insignia would be in coupe form? The phenomenon also shows how the prestige brands undermined the arguments for hatchbacks and coupes but, when the market had been cleared somewhat, moved in with their own offerings. Mercedes, Audi and BMW are now making hatchbacks, a body-style which,according to received wisdom,was too plebeian for them to contemplate. Interestingly, no motoring writers I know of have questioned vehicles like the Mercedes B-class. Using the logic of previous order, such a car ought to have been incompatible with Mercedes´ image of patrician affluence. By the way, the angle and lighting of the Kappa show the form in the worst light, literally. The highlight that runs decisively from the tail to the leading edge of the door washes out in shadow over the wheelarch. You´d never draw a car like this. This general failure is a small pity as in so many other ways, it was the nicest of all the Kappa variants. The saloon and estate are, in the end, rather banal but the coupe was finished with some costly and interesting details which were let down by a small but oh, so palpable weakness of proportion. One mustn’t forget Davide Archangeli’s Peugeot 406 coupé, either! Still a pretty car after more than a decade, it is standing apart from the Kappas and 800s due to actually having been successful. It was also the last accepted “aspirational” variant by a mass market producer. It would be interesting to visit a parallel universe where Peugeot didn’t shoot itself in the foot with the dog’s dinner that was the 407 coupé. If Peugeot had continued producing attractive “premium” coupés, would they still sell well or is the car buying public nowadays altogether too dazzled by the allure of prestige badges? The question I have asked myself ever since the Triumph Herald Coupé is why would people pay more for a less practical car that still looks, from front and rear, pretty much like its saloon sibling? Maybe people with tighter budgets ask this question more often, hence the demise of big two door Fords and Opels. The Gamma and 130 at least had entirely different bodies from their saloon counterparts. For some reason, two doors (or Tudors to use Ford’s rib-tickling pun) were far more popular in Germany than France or Britain, though Morris came up with the barefaced cheek of presenting a two door Marina as a “Coupé”, and Renault have reprised this, more successfully, with the Megane as, now, have BMW. But these are middling cars. What does a big coupe say about you? “I am quite well off. I am getting old. I’ll never have any more kids. I don’t really like that many people. I read The Telegraph. I worry about people getting in the back seat at traffic lights.” Nothing very positive really. … and yet the coupé is still considered the dashing alternative. Recreational driving apparently is at odds with practicality, which means a great many view the rationality associated with four usable doors to be futile within the context of sensuous motoring. Kris. True. ‘Recreational Cars’ are like 6″ high heels and white trousers. They say “I don’t need to be practical. Other people do that for me”. As regards the Kappa picture, I note the rain on the ground and that the couple seem to be sheltering. Could those frameless windows leak that badly? The semantics of two-door cars are interesting and complex. That they do declare a relative lack of want is not itself a sin. Anything more than VW Golf/Ford Focus/VW Astra is excessive, if you think about it. In fact, having a car at all is for many a complete waste of money. I choose to view the coupe as it stands and ask, is it a good one or not. And I do cherish diversity and variety and it pains me in a tiny way that we´ll never see a 508 coupe or Volvo S80 coupe, or even a Coupe Fiat. About the Peugeot 406, yes, good point. That was a car that was well received and which sold quite well. You have to wonder again what sort of managerial incompetence made Peugeot decide saving a few million on Pininfarina´s services was worth the risk of their own staff botching the job. Lesson: never, ever skimp on design talent-. I considered mentioning the 406 coupé in the piece but rejected it on the basis that I didn’t consider Peugeot to be ‘upper-middle class’. For the same reason I also omitted to mention such luminaries as the Ford Cougar, Opel Calibra & Renault Laguna. Also, the cars featured in the article were all based upon larger platforms than the quadrumvirate above. Regarding the image of the Kappa, I endeavoured (manfully) to find a photo where it didn’t look dumpy and ill-formed. This was genuinely the best I could find. It is possible that it looks a good deal more convincing in three dimensions. There is a difference between coupes that are almost 2 door saloons (usually sharing rear panels and being near identical forward of the doors – see old Mercedes), those that are closely based on saloon underpinnings, but with entirely different bodies (see Gamma) and those that are even further divorced from a 4 door cousin. By stretching a point for this last group you could call the XJS a coupe version of the XJ12 and the Citroen SM a coupe version of the DS, since bits of their more mundane relations still lurk underneath. Actually, the SM illustrates the general fatuousness of big coupes. It was championed by the President of Citroen (Bercot) but strongly opposed by the Managing Director (Sarre) who felt it detracted from the need to get a medium sized saloon into production and make some money. Despite my affection for the SM, history has proved Sarre right. As a total car, it was an irrelevant indulgence, a vanity project that fatally distracted Citroen, though technically I am sorry it didn’t have more influence. I always felt there was something silly about 2 door Coupes and it is only the hypocrisy brought on by my ownership of one that has modified this view. Working in the other direction, Bercot vetoed a 4 door SM, though Chapron produced the Opera. A 4 door XJS would have be silly, but semi official Aston V8, Porsche 928 and Ferrari 456 4 doors (OK it’s an estate) exist. Anyway, the point I’m coming to is what 2 door would have made the most interesting 4 door? A Porsche 917? 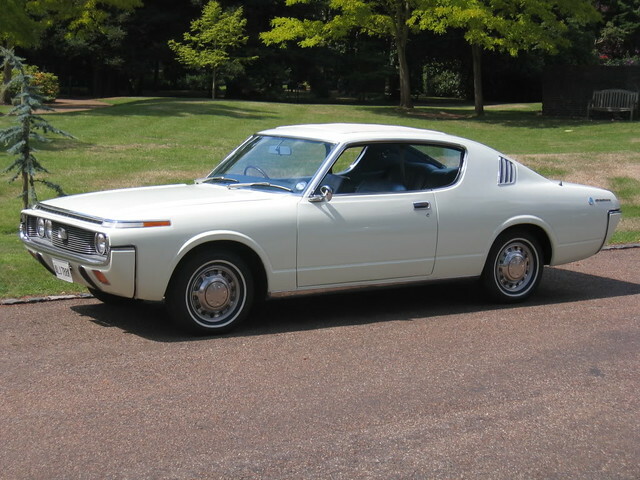 I feel that no discussion of big coupes would be complete without mention of the S60 Toyota Crown 2600 Coupe, a car whose reason for existence I questioned greatly in 1971, but which becomes increasingly attractive to me with the years. I hope I haven’t made anyone feel dirty with that confession. Does the Laguna Coupe of recent times count? This is (I believe it is still in production and sold on the Continent – blast that sounded so British of me). Given the rather limited saloon on which it is based, I find it rather elegant. When Renault withdrew everything bigger than a Megane/ Kangoo from the UK, I rather thought it should have re-branded this as a RenaultSport, used the nice V6 diesel, fettled the chassis accordingly and priced it just around £30k.